Megaera is the fifth encounter in the Throne of Thunder. She is a one phase fight, with limited and simple mechanics, and one major heal-check ability. Megaera is a pseudo-council style fight, with three different heads that spawn, that do not share a health pool. You start with a Venom/Nature and Frost Head, then once you kill one of those heads, a fire head spawns. The order after that is determined by the order in which you kill the heads. Finally, after a head dies, it goes behind the boss area and casts it’s specific ability. Essentially, downing this boss is determined by raid awareness to get out of pools of bad and not dropping fire in the raid. Megaera on normal mode has a very limited tool kit of abilities, which are easily dealt with. At the start of the encounter you are faced with a Venom and Frost head, with a Flame head in the mists out of range. Whenever a head is in the mists out of range, it will do it’s ability. A head moves to the mist when it is killed, and this stacks. For example, if you kill in the order of Green -> Red -> Green -> Blue -> Red, after you kill the second green, you will have to deal with two Venom heads’ abilities. So, as the fight progresses, you will be getting spammed with more and more abilities. Also, each head has a simple, cookie-cutter, tank swap debuff. Now that we understand when we will have to deal with abilities, lets actually discuss them. First, the Flame heads in the mist will cast Cinders on a random raid member. This is a dispelable DoT which will do increased damage the longer it is on the target. When dispelled, Cinders will drop a fire void zone on the ground. 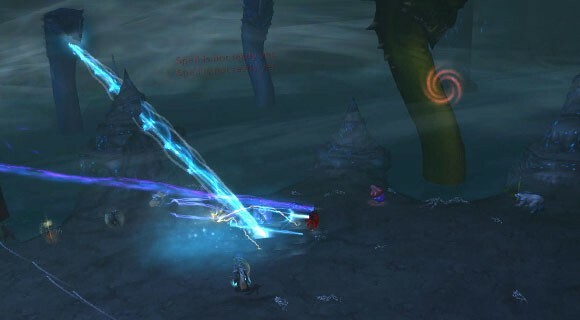 Second, the Frost heads in the mist will cast Torrent of Ice (picture below) on a random ranged raid member. This is a beam that must be kited for it’s duration. Anyone in the beam’s trail will be slowed, eventually snaring them. Finally, the Venom heads in the mist will cast Acid Rain on a random raid member’s location, sending a bolt of poison down. The bolt will do moderate raid damage to everyone, however damage is amplified the closer you are to the impact point. The final ability cast by Megaera is her most important, Rampage. Rampage, at the beginning of the fight, does roughly 90k damager per second to the entire raid. This damage per second is increased by 15% for each head that has been killed. So, rampage will do significantly more damage as the fight progresses. Execution of the Megaera encounter is fairly simple. Both tanks should pick up a head, and face them away from the raid. Ranged need spread loosely in the room, and melee can stack behind the kill target. When someone gets Cinders, they should run towards the back of the room, once there call for a dispel, then go back their normal job. If someone is targeted by Torrent of Ice they should kite the beam away from the center of the room, towards the edges. Finally, if someone is targeted by Acid Rain, everyone should make sure they are as far away from the impact point as possible. When a head dies, Megaera sill go into a Rampage, dealing large raid damage. To deal with this, we advise you set a designated stack point for rampages, where all raid members (including MDPS) except tanks stack for rampage. Due to having melee stack, you should put the stack point within melee range. During the rampage people should use personal defensive CDs and healthstones, in addition to the healers using 1-2 raid CDs back-to-back. When Rampage ends, everyone spreads back out. It is important to note that every time Rampage is cast it will do 15% more damage than the previous, so make sure your healers are ready for this. The healing on this fight is rather light, however it requires coordinated CD usage. The first half the of the fight there is nearly nothing to heal. The occasional Acid Rain will do minor raid damage, and Cinders and Torrent barely hurt if executed properly. Short cooldown healing CDs (redundancy) should be used on the first rampages, so they are available again for latter rampages. Make sure to save all long CDs for the final rampages. In our 25m group we found it easiest to just 6-heal this encounter, and pop 2 healing CDs each rampage. However, it is important not to pop both of these CDs at once, as rampage lasts a good period of time. Do them back to back. Healers with strong CDs and burst AoE healing are naturally strong on this encounter. Resto Druids and Shamans especially excel at dealing with Rampage damage. This most will take most groups less than 5 pulls to kill, it is that easy. Everyone just needs to be smart with dealing with her abilities, and healers need to make sure they are using their CDs effectively, and it will be a kill in no time! If you have any comment, questions, concerns, and corrections please post a comment below, and Happy Healing!